I feel like the week just passed before my eyes. The weather was cooler; we even had rain. I wasn’t melting in a puddle all week long, which was a welcome change. I also was a major homebody. I just didn’t feel like going anywhere. Since I do the drop off/pick up at the train twice a day most days, I feel like that’s my outing for the day. But, in retrospect, I did go places: Walmart, physical therapy, the lab for more blood tests, the library, etc. I just didn’t spend a ton of money, which is a good thing. Because there isn’t a ton to spend these day! –> I go to Walmart about twice a month. It’s close and usually has fair prices on things that aren’t on sale elsewhere. I used the Walmart Savings Catcher app (affiliate link) to see if I could get any price matching money without doing the price matching. I got 48 cents. Haha. 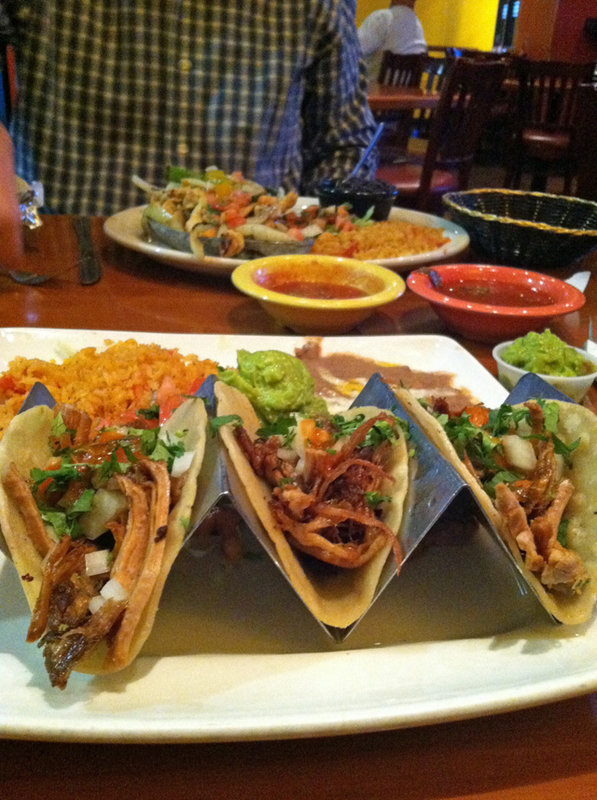 –> On date night we used up a Groupon (affiliate link). Our meal ended up being half off as well as delicious. –> I made a double batch of Easy Chicken Quinoa Bowl fixings so that I could have some easy lunches without the work. –> I cooked a spaghetti squash to serve with leftover meat sauce. FishPapa had that for his lunches two days in a row. 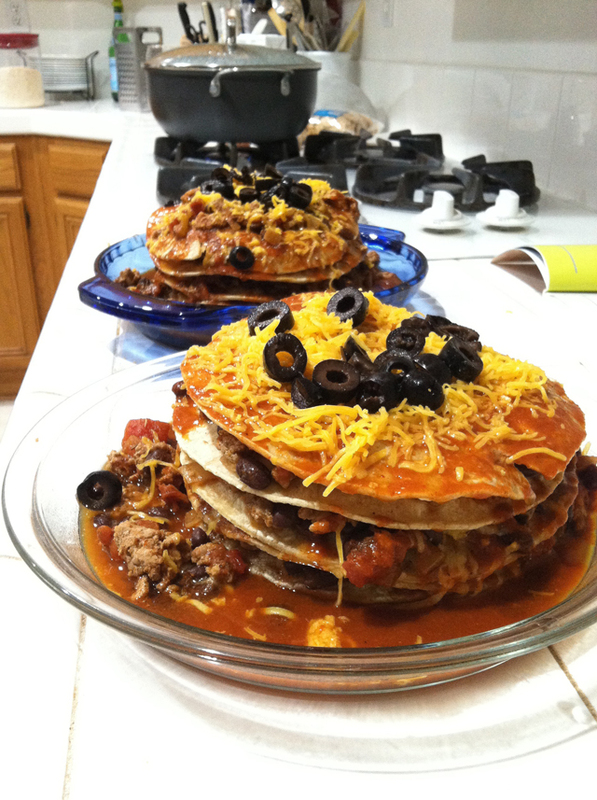 –> I didn’t have all the ingredients I would have liked for Chili Stacks, so I improvised. I used black beans to fill out the ground turkey I had and subbed enchilada sauce when I didn’t have tomato. We lived without as much cheese as I typically use as well as cilantro and sour cream. It wasn’t as good as it usually is, but it worked. I packed the leftovers for FishPapa’s lunch the next day. –> FishBoy18 packed his lunch every day. 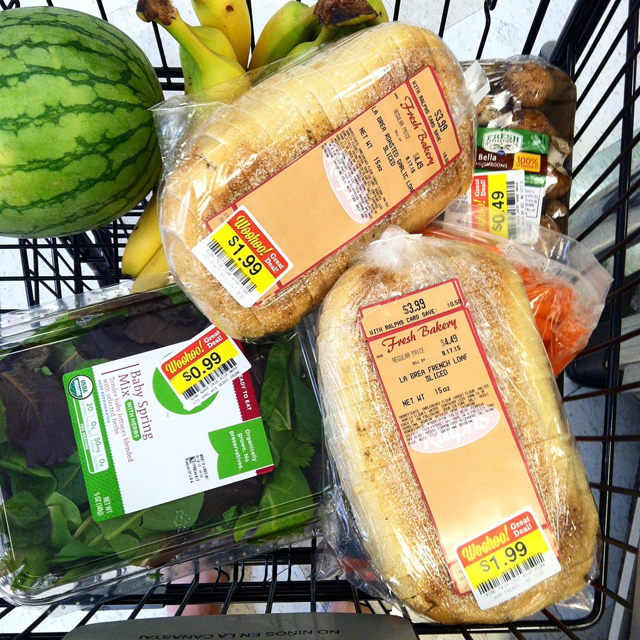 –> I went grocery shopping at Ralphs, one of my very favorite stores, and nabbed some great clearance items. Those are some of the ways that we made it work this week. I have some pretty full freezers, so I need to make good use of what we have. What were YOUR Frugal Foodie Adventures this week? Psst. You can also follow me on Instagram if you want the latest Frugal Foodie Adventures as they happen. Pssst. This post contains affiliate links. If you make a purchase through one of those links, I am compensated a small amount in advertising fees, at no cost to you. Thanks for your support! I went to our local Shaws and snagged 1lb packages of ground turkey with an incorrect sign for $2.99 a package. I verified the price and bought 5 and put them in the freezer. I left the house telling my husband I was only going to spend $50. He laughed at me and I ended up at $39!! This week ( and last) I have been blessed by 2 different friends bringing me lots of their end of garden produce. So far I have had 2 turnips ( swedes) That I have used up ( quite wormy, but I cut out those parts and the rest was good). I had a great buy for her on a tiny roast ( just 2 of us) did supper one night and sandwiches the next day. Finished it up to day along with the left over ground beef from last night’s spaghetti supper, also the spaghetti sauce as well. In a big pot of beef barley soup. used up what was left of free onions, carrots, the turnips, and some of my potatoes, and celery that needed to be used up. We had soup for lunch and supper. Tomorrow I will wash down the fridge inside and another dishwasher load of empty dishes, bowls and such from the fridge ….. I only run the dishwasher when it’s full and with only 2 of us that isn’t everyday. A couple of weeks ago we had our semi annual case goods sale, and I stocked up on those things I like to have on hand. It saves me a lot of money during the next 6 months. Tomorrow I will be making sausage rolls for supper and lunches. I bought a 2 lb pkg. of sausages at a really good price a month ago and will bring them out of the freezer, boil them and then use them in the sausage rolls. Just a side salad, coleslaw and suppers or lunches are ready. I should have 20 sausage rolls and for just the 2 of us that is quite a few meals covered. Dh. loves one for his evening snack. A couple of weeks ago, I bought 2 quarts of heavy cream. I used some of it for what I bought it for in the first place but I was stuck with quite a bit of it leftover. I don’t really know what possessed me to buy so much. So I had to find ways to use it up and now I’ve used all of it so none got wasted. First, I made Vichyssoise, which is what I bought it for in the first place. Then I had some sweet Italian sausage in the freezer so I made a pasta dish with that and the cream, tomatoes, onions, and rosemary. Then I used some to make two trays of mac and cheese for the freezer. And finally, yesterday, I made my hubby’s favorite dessert – crème brulee. Now it’s gone, and I found ways to use it all. I had some small 6 inch flour tortillas in the fridge from making burritos a couple of weeks ago. Rather than let them sit there any longer, I made a snack out of them – homemade chili tortilla chips. They were great! What a great way to use up leftover tortillas. The final frugal thing I did was find a way to use up some leftover uncooked fresh mushrooms. I bought two 8 oz. boxes of them to make some homemade veggie burgers. Again, I don’t know why I bought so much. Last week, the shopping part of my brain was out to lunch. 🙂 So after I made the veggie burgers, I had 1 1/4 boxes left. After they sat there for two days staring back at me from the fridge, I decided I had two choices: throw them out or do something with them; and I just can’t throw food out unnecessarily so I thought about my options and decided to make mushroom marinara sauce for next week. Hubby is going to be on a business trip for four days next week and he always looks forward to eating a “real” dinner when he comes home and he likes pasta after being away so I made that and froze it. It will go with the last two frozen pieces of chicken parmesan that I have in the freezer. You can also spread a little Nutella and sprinkle some cinnamon on it, fold in half and pan fry until warm (no oil or grease needed) for an easy and yummy dessert to use up old tortillas. Thanks Sandi for the idea. I just bought more tortillas for something for next week and I will definitely try your recipe for dessert tortillas. I just happen to have Nutella and cinnamon. This sounds yummy and I can’t wait to try it. Stephanie, I love that you said you’re shopping in your own kitchen. That’s what I’ve been doing. After my huge stock-up a few weeks ago, I’ve just wanted to use up what we had and not waste. Except for daughter’s birthday on Saturday (ok, food out thru Sunday for it), it’s been awesome! You are so creative. Love that you found so many uses for the heavy cream! Last weekend one of our local stores had whole chickens on sale for $1.87 lb – a good price for here. It rained over the weekend and we were gone all day Monday so it was Tuesday by the time hubby could put it on the rotisserie. When it was done, it was fall-apart tender and the taste was wonderful!! That little chicken did us 3 days, having cost less than $5. First night we ate it with hot veggies from the farm stand, second night with cauliflower cheese and last night I paired it with mushrooms bought at the Highliner plant locally ($3.50 for 1 1/2lbs) and made something that resembled chicken stroganoff. Now my challenge is to use up all the mushrooms before they can spoil. Thursday night we had omelettes using veggies from the fridge that needed to be used (including some of the mushrooms). I’m thinking a mushroom quiche would be good for lunches and probably either mushroom soup or a spaghetti sauce, both of which would freeze. Love it when a plan comes together. Crystal that sound like a week with some really smart investment shopping and frugal meals. That is an amazing price for the soup in this area! I too like to stock up on cases of useful things for pantry storage. We too ate mostly out of the pantry and freezer. I am trying to eat down the freezers in preparation for a defrosting session. I cooked up a couple of small roasts and we ate one using the leftovers in sandwiches and noodles. I sliced the second one up and froze slices and diced meat in broth for future meals. We had a cool day when I pot roasted them and I decided it would be just as easy to do two roasts as one. Just a tip for those who bought extra fresh mushrooms…they freeze beautifully. Just clean and slice them, put them into a plastic zip bag, and freeze as flat as you can get them. They aren’t good for eating raw, but I pop them into spaghetti sauce, meat gravy, or even into tuna casseroles. They fry up as nice as fresh and when cooked, you’d never know they’d been frozen. I also use them for stuffed cabbage rolls instead of a tomato sauce. I fry the rolls until well-browned and put a brown mushroom gravy over them before baking. German-style cabbage rolls!! Yummy! Thank you so much Karen. I’ve thrown out more mushrooms that you can imagine because they lingered too long in the fridge which for mushrooms isn’t that long. I really appreciate the tip and I will definitely try this next time I have extra mushrooms. Thanks again. 🙂 One question though. When you say clean them, do you mean clean them in water. I can’t just brush a mushroom and call it clean. I always put them in a bowl with water and then rinse them. What do I do in the case of freezing them? If you rinse your mushrooms with water, I would suggest taking a tea towel or dish-drying towel and patting them as dry as you can get them. I’ve never tried it, but I would imagine a salad spinner might also work. They may be a bit abused looking by the time you’re done, but after they’re sliced, frozen, and cooked, any small imperfections will not be noticeable. I’ve even used my frozen mushrooms on a pizza…after all, the frozen, pre-made pizzas have mushrooms on them too! Good luck! Oh this is awesome to learn, Karen!! Thanks for the tip! My husband loves anything with gravy. Could you share the recipe for mushroom gravy with bread dumpling? He’s also half German, but I’ve never heard of the bread dumpling. This sounds great to me, but I’m trying to figure out your instructions. I have all of these ingredients, I’m just not sure how to combine them together. Are the stale rolls dipped in the egg, or is everything just dumped in a pan? And is it a plain ol’ mushroom gravy or is there some kind of German spin to it? I am first generation American. My mother is from Germany and I have been to Germany many times. My Oma taught me how to make these bread dumplings. In Germany, they are called Vicknoerdle. Not sure of the spelling but that’s close enough. All the ingredients you named that you put in them is exactly the way I’ve been taught to make them too. I have learned one lesson though. The bread has to be really, really stale or else they will fall apart in the water. Funny how this was once a dish to fill people’s stomachs because food was too expensive during the war and now it’s something that people eat because they simply love it. I see people eating them all the time in restaurants in Germany and they are always served with something that has gravy like a roast or Goulash. Here’s a recipe for bread dumplings. After reading through the recipe I feel that it calls for too much milk, the milk is meant to moisten the bread cubes/slices but they shouldn’t swim in the milk. There is not exact measurement, if the bread is drier, use more; less dry, use less. The mixture should hold together when you form the dumplings. Kind of like a bread snowball. Try not to squeeze them too much, they shouldn’t be dense. I form my dumplings and put them on a plate uncovered for 20 minutes or so, so they develop a skin of sorts. That helps them stay together when simmering in the water (salt the water as you would for pasta). The dumplings will sink when first put in the water, then slowly rise to the surface of the simmering water. Allow them to simmer at least 15-20 minutes so they cook through. They begin to roll around in the water as they’re getting close to done. You might want to sacrifice one and cut it open to see that it’s cooked completely through to the center. Perfection does come with practice to get the ratios of milk to bread correct, but if they fall apart in the water, they’re too wet. Try a small one first as a test if you’re unsure. The gravy is heavily mushroomed, that’s the bulk of your meal. In Germany, mixed wild mushrooms are used. I usually use a mix of white and cremini, but plain white mushrooms work too. I’ve been known to cheat and fry up a pile of mushrooms and use a packet of mushroom gravy mix (shh, don’t tell!). This is German country food; humble, filling, and best of all, delicious! While taking an inventory of my freezer, I noticed my supply of pre-made black beans had been depleted. I soaked a cup of beans which gave me 3 overflowing cups of cooked black beans to restock the freezer. Found a cilantro-lime pesto recipe which I froze into cubes as a time-saver for when I make the black-bean and rice dish. Cooked a free meal of gumbo soup. I had a chicken carcass to make some stock; added a bag of frozen gumbo vegetable mix which I got free, courtesy of a store coupon from Kroger. With leftover frozen rice in the freezer, this was a quick and inexpensive dinner with some leftovers for lunch too! Earlier in the week, I used a free coupon for a bag of Spinach/Ricotta ravioli. Butternut squash was offered at a reasonable price so I purchased two and have saved the rinds and ends to put in my “garbage soup” freezer bag. Right now, there are corn cobs, mushroom stems, carrot peels and the butternut squash bits and pieces. Any day now the bag is ready to be transformed into a vegetable stock! I’ve been going to the manager’s clearance in the meat department for months now, and getting very good quality meat (steak, roasts, etc) for half price or less. This is at Smith’s, which is part of the Kroger chain. I failed to join in the frugal conversation last week; just got too busy and then it was this week! As is is, this is 4 days after you posted, Jessica! 2-3 weeks ago I stocked up after vacationing much of the summer. So the past few weeks we haven’t needed to buy much (milk, lettuce, tomatoes, bananas). Except the scout pizza night fundraiser at a local pizzeria, we ate food from home. I got pretty busy several days and still managed to avoid takeout even though I hadn’t planned well, which was huge! Partly this was due to the fact that in August right before we left town again, I made two different pots of soup and froze them, enough for 4 dinners! We have eaten 2 nights worth. My kids are wanting to eat in more (and if daughter wants her chipotle, she’s got plenty of her own income right now for it!. My son is suddenly caring more about eating a healthier diet. Might be that he’s in high school now. Also might be because he’s got health this semester and the first topic they’re covering is nutrition. But hey, I’ll take it! Looking forward to more of these posts! They are awesome and people are posting great ideas! Sorry I don’t have detailed fun food ideas this time around. My brain is fried tonight, after a somewhat miserable day. My car broke down on a busy street in downtown Washington DC today. It was kind of awful. But I still managed to not do takeout! Chicken Caesar salad… the easiest when you keep breaded chicken from Costco in the freezer!